A few months back I was getting to the point of extreme frustration in regard to sleeping on my sides. I have a partial labrum tear in my left shoulder from years of sports, weight training, and lord knows what other repetitive activities. I would also not be surprised if I have a small tear in my right shoulder. Sleeping on either side would inevitably wake me up with sharp pain. Being a rehabilitative professional, I of course took it upon myself to strength train the rotator cuff and scapular muscles. After a few months of focused exercise compliance, I can say that this helped quite a bit. Subjectively my pain had decreased by over fifty (50) percent with sleeping. I would still however spend most nights flipping from one side to another because pain would wake me up. Sleeping directly on one’s side is not ideal for shoulder mechanics. I have found that in most cases, one (or more) of several things might occur. 1. The head of the humerus can be directly compacted into the socket, which has potential to irritate the tendons, the joint, and other soft tissue structures. 2. 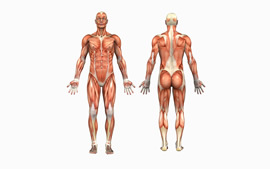 The brachial plexus, or confluence of nerves that innervate the muscles of the arm, can become compressed by the weight of the body through the shoulder, especially if the arm is placed at or above the level of the shoulder. This can result in numbness, tingling, or pain up and down the arm. 3. Depending on the nuanced position of the body, the head of the humerus can be “pushed forward” in the socket. 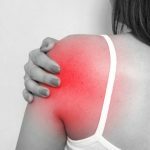 This can lead to point specific shoulder pain and can feed into either a chronic laxity in the anterior portion of the shoulder and/or stiffness in the posterior shoulder capsule. 4. Sleeping on one’s side with the arm overhead can directly impact rotator cuff tendons into the acromion portion of the scapula. 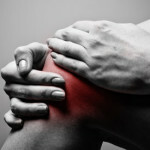 As one might guess, this is painful and can produce chronic inflammation. In the past few years a few products have come out that are attempting to address the negative consequences of side lying sleeping. I looked around and tried to find a specialized pillow that would lessen the overall weight placed through the shoulder. Here is my take on what I experienced from sleeping on the MedCline Pillow. 1. The pillow does what it claims. 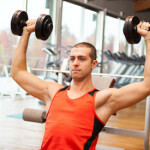 I noticed an immediate and marked decrease in the amount of pressure placed through my shoulder. The placement of the shoulder through the pillow works well, and I did find the shoulder placement to be comfortable and sustainable. Specifically, I no longer felt like the head of my humerus was forced in a forward direction. 2. The pillow has a basic wedge shape, and it is large. In order to allow room for the shoulder to rest comfortably through the pillow, the head of the pillow does need to be significantly higher than the level of the bed. The only way to accomplish this while maintaining body comfort is to make the pillow large, allowing for a gradual incline. For some people, this may take a bit of getting used to. 3. I found it somewhat vexing to transition from side to side. In order to transfer, one needs to pull the entire bottom-side arm out of the hole before being able to roll to the other side and insert the opposite arm in the same fashion. In my opinion this cannot be done unconsciously while in a half-sleeping state. You really do need to be moving in a volitional manner to accomplish this. 4. I needed to make some adjustments to the head support in order to feel comfortable. Specifically, I needed extra support for my head in order to make it feel like my cervical spine was neutral (not side bending). This may be partially due to my height and size. Overall, the change in my shoulder comfort has been remarkable. 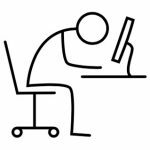 Once I made adjustments and acclimated my body to the feel of the new sleeping position, my shoulder pain was almost entirely gone after about one week. I will use the pillow “as needed.” I am now able to tolerate side sleeping without the pillow for weeks or months at a time. 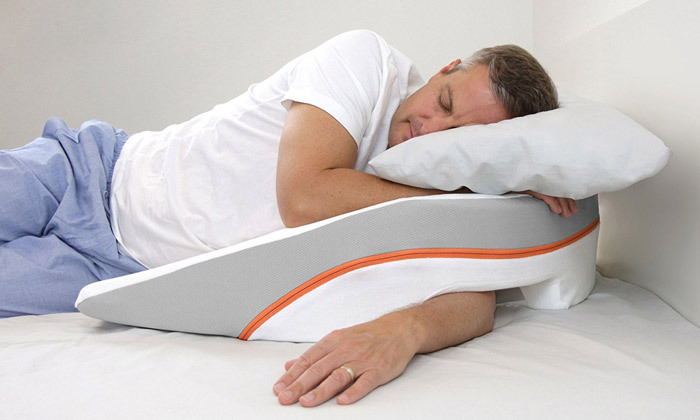 If I find that my shoulder pain starts to creep back when side sleeping, I will use the MedCline Pillow until the pain has subsided. 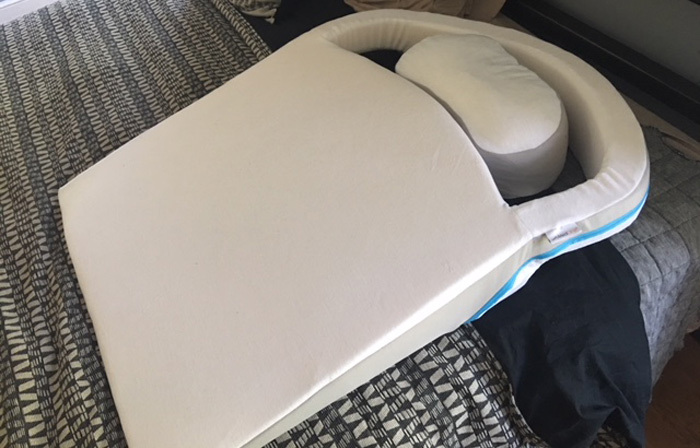 View the MedCline Advanced Positioning Wedge Pillow on Amazon.